The G+ profile is having unique and decent features for users. Your Google+ profile send a clear message to your followers about your concept and creativity. Basically, this platform saves your photo and creativity. You can create a community and add your self from different other platforms. The platform provides the facility to add your photo, tagline and can share the photo with other people. This is the biggest platform to provide the assistance to blogger to make the profile and share content through it. It is also very helpful to increase the traffic on site. Continue posting and sharing content through this platform, your followers' count will increase day by day. The setting option will provide you to share post and content to a specific age group and country. 1. You can restrict to share the content to a Specific age group. 2. Can choose the option to restrict access by location. 3. You can not facilitate the sale of alcohol and tobacco. 4. The user can view or delete name tag linking you. 5. Can download photo from there. A customer URL can be created in short to add to your blog content and can use the memorable web address. Google has provided the option to change the URL up to three times in a year. 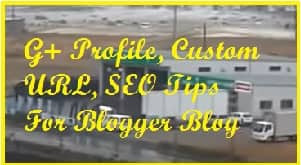 If customer URL is available for you then the link creation will be seen below the profile image. You have to click on it. The custom URL will reflect and provide the option to choose one of these. Now add some text and information then click on TOS agreement. The next step is required your confirmation only. * You will require 10 or more followers. * Account should be 30 days old. * Profile should contain your photo. * Account should be good standing. If you are ready to follow these four-star points then you are entitled to create the custom URL. SEO is very much important for the site. This is the rule to follow the site owner and make the site according to the guidelines. SEO full form is “Search Engine Optimization”. * URL should be SEO friendly. These are some basic points of requirement. The content quality and SEO is the main tools, which will help to improve the site traffic. If your site did not comply with the above-given star points, the site will not be working properly. When you start to manage the site then first check your site through SEO checker tools.